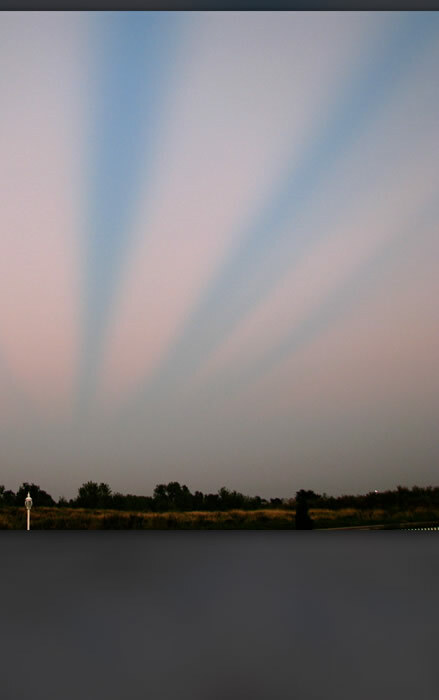 Anticrepuscular Rays seen by Rick Alexander close to sunset Friday 22nd August 08 at Fairfield Iowa. Image ©Rick Alexander, shown with permission. The camera is pointing east. These rays, produced by clouds in the west shadowing the sun, stretched right across the sky to converge to a point directly opposite the sun's position. Anticrepuscular rays are of course parallel but converge as they get more distant in the same way that roads or railroad tracks do. The deep sky colours are possibly another example of August's unusual sunset skies over North America. The recent eruptions of three stratovocanoes in Alaska's Aleutian Islands could be responsible. Volcanoes inject huge clouds of dust and aerosol forming sulfur dioxide into the stratosphere. High altitude winds spread the particles widely to scatter sunlight and produce glorious sunsets, rays and Bishop's rings.